Earlier this Spring, Viaje Cigars released a new cigar called Viaje Jalapeno. The Jalapeno was released along with another three cigar line called Senor Andre’s Chiccharrones. While it wasn’t intentional, the cigars took on theme for Cinco de Mayo. Like many other cigars, the Viaje Jalapeno was released in a shroud of mystery with the only details known that the cigar employs a theme of a spicy pepper in both appearance and profile. Recently I’ve had a chance to take a look at the Viaje Jalapeno. 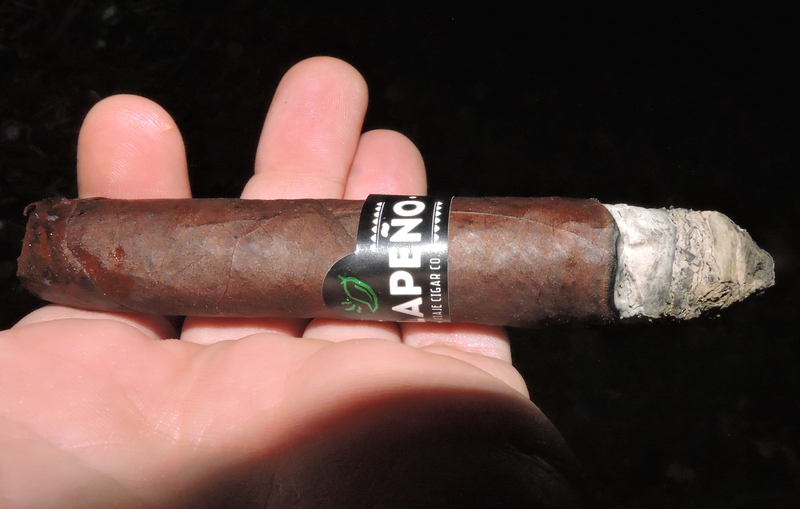 Overall, I found this to be an excellent cigar and one that certainly stands up to its spicy expectations. Without further ado, let’s break down the Viaje Jalapeno and see what this cigar brings to the table. Details of the blend of the Viaje Jalapeno have not been disclosed. The cigar is made at the Raices Cubanas factory in Honduras. The Viaje Jalapeno is available in one size – a 4 7/8 x 51 figurado. The size and shape is similar to what has been seen on the Viaje Exclusivo Chiquito 2015. The cigars are packaged in 25 count boxes. The wrapper of the Viaje Jalapeno has an dark roasted coffee color. Upon closer examination, there is some darker marbling on the surface. The wrapper has a very light coating of oil on it. There are some visible wrapper seams, but there wasn’t much in the way of visible veins. The figurado almost has a salomon-like shape with a short 1/4 inch nozzle-shape on the footer. The footer is open with a short diameter. The cigar has its widest point just above the nozzle-foot and tapers toward the cap. The Viaje Jalapeno features a black colored band at the center of the cigar. The text “JALAPEÑO” is prominently displayed on the band in white font. Above the text is small green-outlined jalapeno pepper design. There are some white adornments across the top and bottom. In the middle of the lower adornments is the text “VIAJE CIGAR CO” in white font. 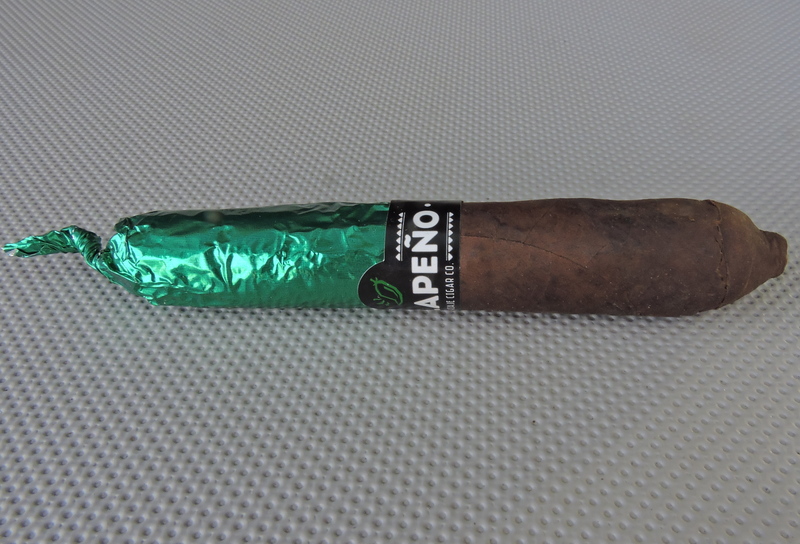 There is a green foil covering the upper part of the cigar from the band to the cap. The foil is twisted at the cap to give the appearance of a jalapeno stem. After removing the green foil from the upper part of the cigar, I used a straight cut to remove the cap of the Viaje Jalapeno. Once the cap was clipped, I moved on to the pre-light draw. The cold draw provided a mix of espresso, citrus, and some pepper notes. Overall I considered the pre-light draw of the Viaje Jalapeno to be satisfactory. At this point I was ready to light up the Viaje Jalapeno and see what the cigar experience would have in store. The Viaje Jalapeno started out with notes of citrus, coffee, and a combination of red and green pepper (the latter could be power of suggestion given the cigar name). The coffee notes became primary early on. The citrus and pepper notes became secondary. Meanwhile the red pepper was prominent on the retro-hale. Later in the first third, the citrus notes began to make their way into the forefront. The coffee and citrus notes alternated in intensity as to which note had the edge. Meanwhile the pepper notes were a close secondary note. During the second third, I found the pepper notes began to increase. By the midway point, I found the pepper notes had displaced the coffee and citrus as the main flavor. Later in the second third, while the coffee and citrus was still present, I also picked up some dark chocolate in the background. By the last third of the Viaje Jalapeno, the spices were very dominant with the coffee, chocolate, and citrus notes much further in the background. This is the way the flavor profile came to a close. The resulting nub was soft to touch and cool in temperature. The burn of the Viaje Jalapeno performed quite well. The cigar took a straight burn bath from start to finish. The cigar didn’t have much trouble going from the narrow nozzle-shaped footer to the wide part of the cigar. There was a slight uneven-ness on the burn line, but this easily remedied with some touch-ups – and the amount of touch-ups was not excessive. The resulting ash was firm with a charcoal gray color. The combustion proved to be good – as the Jalapeno had an ideal burn rate and burn temperature. The draw proved to be excellent. I’d categorize this as an open draw, but not a loose one. This was a low maintenance cigar to derive flavor from. From a strength perspective, the Viaje Jalapeno started out medium. The strength increased linearly as the cigar experience progressed. By the second third, the strength level was medium to full and toward the end of the cigar, the Jalapeno was at full strength. Meanwhile the body of the Jalapeno started out medium to full and also increased linearly. By the second half, this cigar entered full-bodied territory. In terms of strength versus body, I found the body had the edge, but the gap closed as the cigar experience progressed. The Viaje Jalapeno is what I would categorize as a fun cigar to smoke. It produces some very nice flavors. Not only does the strength and body increase, but the spice level is going to increase as well. 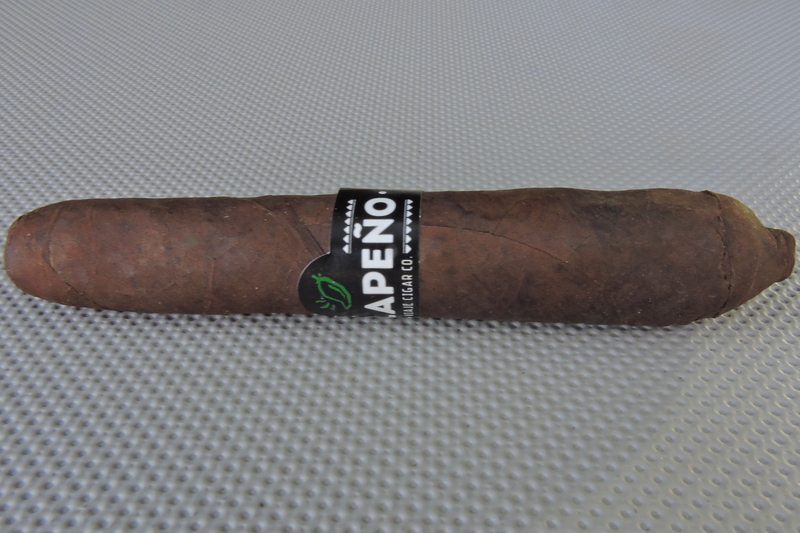 By the second half, it’s very clear why this cigar was given the name Jalapeno. I also liked the figurado shape of this cigar as I think this contributed to how this cigar increased in intensity. While not a cigar for everyone’s palate, this still delivers a nice smoke. Given the boldness of this cigar, the Viaje Jalapeno is a cigar I’d recommend to a more experienced cigar enthusiast. As for myself, this is a cigar I’d smoke again and it’s worthy of a box split.